When you buy a License from Easy Software Deployment it will be supplied to you in a .lic file format. 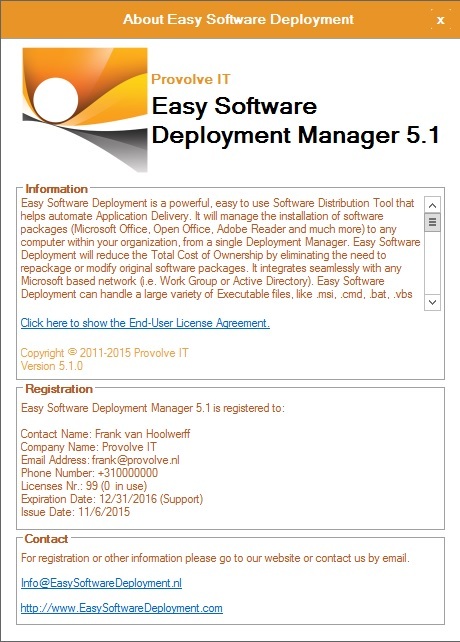 The first year the license also gives you product support from the Easy Software Deployment Team. In this guide we show you how to register the license in the console and also how to validate the license. Placing the License for the first time. 1 You will receive the license file via the supplied e-mail address. 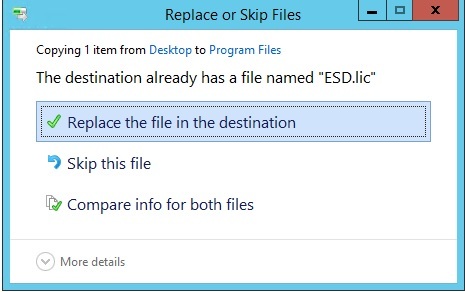 Save this license file and copy it to the program files share where you have placed the ESD executable. 4 Now to check the status of the license on your agents, logon to a client machine and open the ESD information screen. Here you see your License number and the Expiration date of your support. 6 It is also possible to check the license from the console, in the console go to Help -> About. When you reapply for support with us after the first year, or maybe when your organization is growing and you need a larger number of licenses this part of the guide is for you! 2 Because there is already a license file present you will get the following warning (dialog may look different in case of a different OS version), please make a copy of your old file and rename it to .old in case something went wrong. 4 Check your new license status on a client machine. Logon to a client machine and open the ESD information screen. Encounter any problems? do not hesitate to contact us! Easy Software Deployment is charged annually in advance. After your purchase we send you an offer/quote which needs to be signed & returned to us. Then you will receive an invoice for the agreed amount of devices together with the license file and our help to get you set up. What does the licensing model look like? We give out licenses for the amount of devices you need to manage. A device is an end-point (desktop, laptop or server) which has the Easy Software Deployment Agent installed. What does Easy Software Deployment cost? Easy Software Deployment costs €1,50 per device per month excluding taxes. For example: 100 devices will cost you €1800,- per year excluding taxes. This also includes our awesome technical support and updates to Easy Software Deployment. Schools and non-profits pay €0,35 per device per month excluding taxes.